This weekend has seen Games Workshop’s latest showcase event, the Vigilus Open Day. For the avoidance of doubt I’d better clarify that I wasn’t there myself but, like so many other hobbyists and fans, I was glued as best as I was able to the updates and reveals coming out of the event via social media. Being at work over the weekend I’m only just getting the chance to catch up properly on everything that was announced now, long after the rest of the internet has had its say, but I still couldn’t pass up the opportunity to pontificate a little and share my thoughts on the things we saw. Poor old Marneus Calgar. One of the most iconic and long established space marine characters, he’s been the posterboy for the Ultramarines and, as a result, the man everyone loves to hate, since the early days of 40k, when he wore the kind of coat any pimp would be proud of, cultivated an imposing man-spread and kept dinosaurs as pets. Ultramarines Commander Calgar, as painted by David Gallagher. Alas, whilst it’s all very well being second only to Roboute Guilliman himself when the Primarch is lying in state it’s a lot less impressive when he’s walking, talking and taking command of the Imperium. Love him or loathe him, and for many of us it’s a little of both, it’s been hard not to feel a little sorry for Calgar over the last couple of years. The return of Roboute has seen him pushed firmly into the backseat, a poor man’s Primarch if ever there was one. Since the arrival of Primaris marines a popular theory (although I stress that it remains only a theory) is that GW will seek to weed out the old, distinctly undersized, marines of yesteryear through a process of slow attrition, allowing the old-style small marines to look increasingly dated, moving them out of the limelight, promoting the newer, more imposing Primaris models whilst the background describes a winnowing of the older troops. It’s a convincing theory but it leaves us with the problem of the special characters. Whilst it’s one thing to get rid of a tactical marine in this manner and replace him with an intercessor, it’s quite another to dispose of Azrael, Ragnar Blackmane, Mephiston or Dante. The answer; to see them reforged, renewed and reborn as newer, bigger, better Primaris warriors -and who better than Calgar to lead the charge. Speculation of other loyalist Primarchs making a return and joining Guilliman in defending the Imperium continues to rumble on, and could easily fill a blog or two by itself, but it’s worth noting that, however things turn out, the creation of some imposing, modern models for the heroes of the Blood Angels, Space Wolves or Dark Angels could still provide centrepiece models to be proud of, without such controversial moves as bringing back Russ, the Lion or even – whisper it – Sanguinius. Of course I still find myself wondering how GW would, under this scenario, choose to handle those amongst the Space Marines like Gabriel Seth, who has expressed a distinct disapproval for the Primaris newcomers, historic characters like Tycho or the Grey Knights who, we’ve been repeatedly told, have no Primaris brothers at all. Then there are the stranger elements, reflecting 40k’s more mythic and fantastic side. Will the likes of the Sanguinor and the Legion of the Damned find themselves growing bigger over the coming years or will they end their days as bizarrely short characters, manifesting at little more than chest height amongst their younger brothers? Only time will tell. As an aside, interesting though Calgar is from a theoretical point of view, I’m actually more impressed by his Honour Guard. They haven’t had the same attention paid to them as their boss so far but their predecessors were amongst my favourite Space Marine models, real exemplars of how the range could look at its best and these are worthy successors. In the old days the rules allowed for every Chapter Master to have a squad of Honour Guard so part of me is already wondering about how these can be converted to serve the Chapter Master of my own Knights Mortis. Then again converting them might involve removing some of the features that make them so iconic so who knows, maybe, just maybe, I’ll cross the Rubicon and paint them as Ultramarines. Haarken Worldclaimer may undoubtedly be a member of the Black Legion but his origins amongst the Night Lords remain stamped upon him too, from the skull helm to the flayed skins to the Nostraman spear he’s armed with. It will be interesting to discover if this is a new special character for the forces of Chaos or simply a generic chaos lord with a unique name and a little background as we’ve seen with the likes of Kranon the Relentless in the past. I’ve actually been wondering what might become of the special characters set out in the Chaos Marines codex. Already we’ve seen the likes of Typhus and Ahriman farmed off into their own respective legion codexes and it seems likely that in time the Emperor’s Children and World Eaters will see the same treatment, taking Kharn, Lucius and Fabious with them. Is Abaddon to be left on his own or will GW take the opportunity to bring in more characters that exemplify other aspects of the traitor legions. Nice though it is to imagine I suspect that the other traitors – the Night Lords, Word Bearers, Iron Warriors and Alpha Legion – may not get the full codex treatment for quite some time, if at all. Of course all of them could be made into a unique army, both in terms of rules and aesthetic, but who could blame GW for shying away from concentrating exclusively on Chaos for the length of time that would require. Instead I imagine that as the Chaos Marine range is developed in the future we’ll see more of these legions and less of their monotheistic brothers. Then, assuming that these prove popular, and the god-specific legions are a financial success for GW, we might someday see Lorgar or Perturabo emerging from the warp at the head of a horde of cultists and possessed, or massed ranks of daemon engines. In the interim some new characters might just be the way in which they decide to drip-feed us with a little taste of the direction they could someday choose to follow. For me, the best bit of these reveals are, without doubt, the genestealer cultists. It’s an army I have a real affinity for in both 40k and Necromunda and I can see myself using these both in my long planned 40k army and in narrative, house-ruled scenarios around the Underhive. I’m already considering transforming a Goliath Rockgrinder into an Orlock rig and one could easily do something similar with these to make outriders to accompany it, House messengers who need to be intercepted by your gang or, turning the tables as so much of the recent genestealer cult range has been borrowed from the Imperial Guard, how about making them into rough riders. Plus there are probably several clever people already cooking up house rules to incorporate these into Speed Freeks. Accompanying them we have the tactician pondering his already famous map of Warhammer World, a model which old timers will recognise as a remake of a much older, and extremely rare, figure from the early days of the range. Again this is a brilliant model, with the expressively grumpy face being an excellent touch. Give it a few tweaks and once again it could fit in well with an Imperial Guard army or an Inq28 retinue (where it will doubtless prove popular). The only downside is the defaced aquila which sadly just looks amateurish. 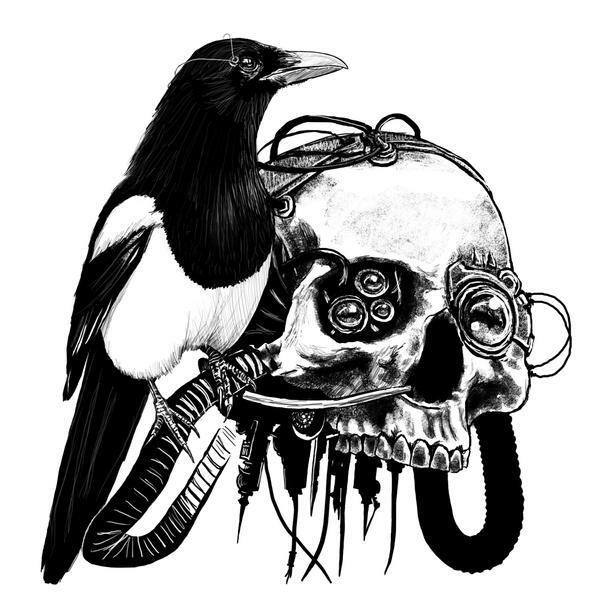 All of us who are fans of Chaos Marines or Traitor Guard have scratched through an aquila at one point or another so we could make use of a torso or piece of equipment that wasn’t otherwise available, and for all that it’s a rite of passage it’s also a cliché. I’m sure GW could have thought of something better here. In some of the more frothy corners of the Internet there’s been a little chatter that GW have somehow “forgotten” about the genestealer cultists, simply because their codex hasn’t arrived yet (and despite the fact that GW haven’t been shy about promoting them lately). Of course GW has form here, they essentially abandoned the Sisters of Battle for over two decades, but I think that the idea that genestealer cultists have been booted to the kerb so soon after their relaunch in 2016 seemed farfetched. Did we really imagine that they were going to leave them without an 8th Edition codex forever, or perhaps mark their demise only with a glib assertion that the Squats must have eaten them all? Over the last little while GW have been drip feeding us images of the contents of the forthcoming Wrath and Rapture box set, an all-daemons collection starring the forces of Khorne and Slaanesh. With the release date confirmed as falling within the next month they’ve shown us the two new characters which will be joining the new Flesh Hounds (good thing I finally got my old ones painted eh!) and Fiends of Slaanesh in the box. Karanak looks a little odd but frankly a dog with three heads is always going to look rather weird as a physical object rather than as a mythological concept. Overall I’d say they’ve made the best job they could of done without straying too far from the design elements that had gone before. Meanwhile the Slaaneshi harpist has yet to be shown off properly beyond what can be made out from the promotional video and the photographs taken by those who attended the event. However it’s fair to say it’s looking very interesting already and packs a punch of body horror that should put paid to those claims that Slaanesh was going to be removed or toned down. I almost overlooked the titan amongst all the other exciting stuff that was appearing, and judging by the chatter online I’m not the only one. For such a big and imposing model from me at least it’s only managed to generate a shrug. The trouble with titans is that they are so astoundingly expensive. One could buy a few good armies for the price of a single warlord model so as a result the audience for them is extremely limited. I for one very much doubt that I will never own one. Of course I’ve always fancied the idea of riding to war in a Titan (or even just turning up to work in one) but not so much painting one (and certainly not applying for the bank loan required before buying one of the damn things). Plus, as a small image on a screen they just don’t look their best. Nothing beats seeing a Titan in person. 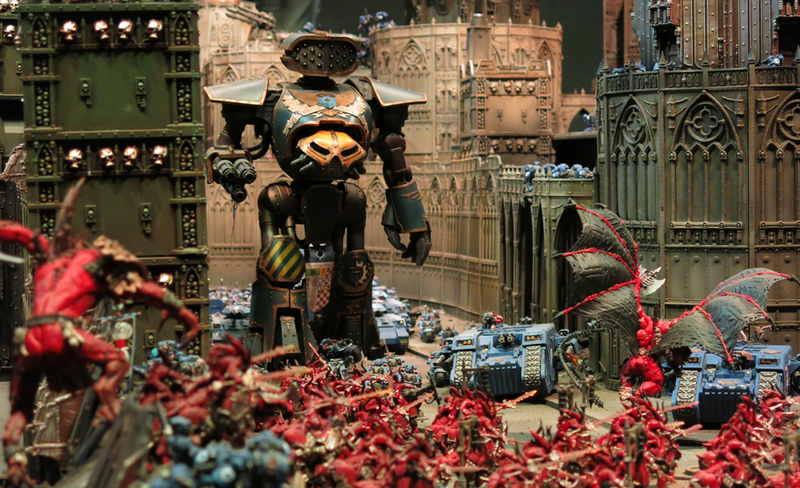 Even a gaming table isn’t really big enough for them, and the best place to really appreciate them is in huge dioramas such as the one at Warhammer World which shows the Ultramarines battling the World Eaters. Of course GW are a wealthy company and can afford to indulge in vanity projects such as this. However creating such a monster will have undoubtedly consumed a great deal of staff time and production resource. Surely that would have been better spent on subjects with a broader range of appeal such as Horus Heresy, Lord of the Rings, Necromunda characters and brutes or Blood Bowl star players, all of which still have plenty of gaps unfilled? Don’t get me wrong, the range we have already is great but do we really need more at this scale? perhaps I’m alone in this but for me the best place for Titans is Adeptus Titanicus. Isn’t he just a sight for sore eyes? Or perhaps it’s more the case that he’s a sight which causes sore eyes. Yes, GW are continuing to pillage the archives, this time bringing back this iconic old model. Now honestly I wouldn’t want every Noise Marine to look like this, guitars as sonic weapons as just too silly even for me (although if GW fancied a modern revamp of the old Ork Goff Rockers I wouldn’t say no!). I’m hopeful that sooner or later we’ll see a full Emperor’s Children release, complete with a proper kit for Noise Marines, and if they all look like this I might grumble a little, but as a one off he’s excellent, a real nod to the hobby’s past and a great trip down memory lane for us old hands. Newcomers however, raised to a 40k of unrelenting seriousness, must be trying to work out what hit them! Overall then a very interesting set of reveals that give us plenty to look forward to as we head towards 2019. As ever if you have any thoughts on what we’ve seen here I’d be very curious to hear them, after all if you don’t share your thoughts in the comments box how am I supposed to rip them off and claim them as my own later?